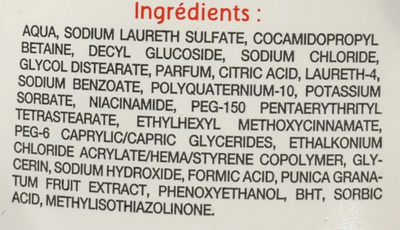 Aqua, Sodium Laureth Sulfate, Cocamidopropyl Betaine, Decyl Glucoside, Sodium Chloride, Glycol Distearate, Parfum, Citric Acid, Laureth-4, Sodium Benzoate, Polyquaternium-10, Potassium Sorbate, Niacinamide, PEG-150 Pentaerythrityl Tetrastearate, Ethylhexyl Methoxycinnamate, PEG-6 Caprylic/Capric Glycerides, Ethalkonium Chloride Acrylate/Hema/Styren Copolymer, Glycerin, Sodium Hydroxide, Formic Acid, Puniac Granatum Fruit Extract, Phenoxyethanol, BHT, Sorbic Acid, Methylisothiazolinone. Product added on February 6, 2016 at 7:19:38 PM CET by tacite. Last edit of product page on March 26, 2016 at 6:55:46 PM CET by .